“Szekszárd Grand, what’s that?”, I hear you asking. It’s a new category which was probably dreamed up as some sort of glorified outlet for top quality cabernets produced in Szekszárd. I don’t think it’s a particularly good idea or that it will be a long-lived one. 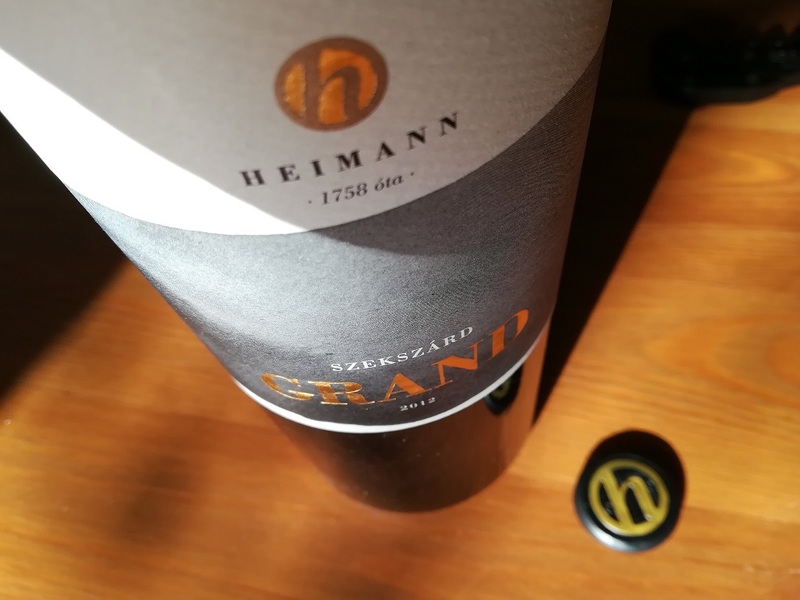 However the Heimann Szekszárd Grand is a huge wine which might even prove to be great in the long run. My belief in the Heimann’s capacity to produce great reds is stronger than ever. A few weeks ago I participated in a Barbár vertical tasting and all the wines showed pedigree and staying power. What’s new, you may ask. Well, there was one Barbár, the oldest in the line-up, a 2007 served from Magnum that just blew me away (and for that matter everyone else at the tasting). I must admit I was not really expecting to taste a Hungarian red that is a worthy rival of my favourite brunellos or rioja gran reservas. The last time I tasted a truly great Hungarian red – or so I thought – it proved to be a bitter failure; the 2002 Sauska Antique Cuvée which was a wine produced by Attila Gere during the trial runs for the Sauska Winery and which I had fond memories of was rather light-weight and distinctly green with drying tannins. But the 2007 Barbár took my breath away, it was one of those very rare magic moments when you just have to dispense with playing the judge and immerse yourself in the beauty of it all. Incredible complexity, faultless balance, velvety tannins. There is still ample fruit but interlaced with aromas of balsamic vinegar and the exciting saline umami of light soy sauce. It has so much oomph and vitality that I’m sure it can go on for another 5-7 years without dropping off. The 2009, the 2011 and the 2012 may reach similar heights but they have all been long sold out. The 2015 is not on the same level, and I haven’t got a clue where the embryonic 2016 might end up after a decade. So I reckon your best chance of experiencing something similar to the marvels of the 2007 lies with the 2012 Szekszárd Grand. Which at the moment is practically unapproachable. Made from sagrantino, cabernet franc and kékfrankos the Szekszárd Grand is a shamelessly big wine built for the long haul. If it resembles anything at all, the closest point of reference is probably a Supertuscan. Tightly knit, the nose doesn’t give away much. After some aeration notes of blackberries, blueberries, cherries, pencil shavings, balsam and soy sauce emerge. The palate is big and bold with an earthquake-proof structure that relies on the sinewy acids of sagrantino and kékfrankos reinforced by the tannins of cabernet and sagrantino. It avoids the trap of being sweet or over-extracted but there is some heat on the finish. Epic length. A wine for cellaring. What you get today is certainly not worth the price, but my guess is in 5-6 years’ time it will be seen as prudent investment. 7 points and 49 euros.